Chronic infection with the bacterial pathogen Helicobacter pylori is a risk factor for the development of gastric cancer, yet remains asymptomatic in the majority of individuals. We report here that the C57BL/6 mouse model of experimental infection with the closely related Helicobacter felis recapitulates this wide range in host susceptibility. Although the majority of infected animals develop premalignant lesions such as gastric atrophy, compensatory epithelial hyperplasia, and intestinal metaplasia, a subset of mice is completely protected from preneoplasia. Protection is associated with a failure to mount an IFN-γ response to the infection and with a concomitant high Helicobacter burden. Using a vaccine model as well as primary infection and adoptive transfer models, we demonstrate that IFN-γ, secreted predominantly by CD4+CD25− effector TH cells, is essential for Helicobacter clearance, but at the same time mediates the formation of preneoplastic lesions. We further provide evidence that IFN-γ triggers a common transcriptional program in murine gastric epithelial cells in vitro and in vivo and induces their preferential transformation to the hyperplastic phenotype. In summary, our data suggest a dual role for IFN-γ in Helicobacter pathogenesis that could be the basis for the differential susceptibility to H. pylori-induced gastric pathology in the human population. The Gram-negative bacterium Helicobacter pylori colonizes the human stomach and is associated with a range of gastric and duodenal disorders including chronic gastritis, stomach and duodenal ulcers, MALT lymphoma, and gastric adenocarcinoma (1, 2, 3, 4, 5). Whereas ∼20% of infected individuals develop symptomatic disease, the large majority remains asymptomatic despite persistent, often lifelong colonization with the bacterium. This wide diversity in colonization outcome has been attributed to strain differences (Western vs Eastern Helicobacter strains), genetically determined host susceptibility, and lifestyle factors such as nutrition and hygiene (6). However, no single universal explanation has yet been found to hold true across all populations studied, and it is likely that a combination of multiple factors determines infection outcome. Roughly 1–2% of infected individuals develop gastric adenocarcinoma, the fourth most common diagnosed cancer and second most common cause of cancer-related deaths worldwide (7, 8). Gastric cancer is traditionally classified into two subtypes based on its histological architecture (9). The intestinal type, characterized by cohesive growth of cells in quasi-glandular structures, has been presumed to arise secondarily from intestinal metaplasia, whereas the diffuse type, in which tumor cells are dispersed and generally not organized into glandular structures, is thought to arise directly from nonmetaplastic foveolar or mucous neck cells (9, 10). Little is known about the molecular pathogenesis of either type of gastric cancer. This may at least partly be due to its diversity; in fact, in a transcriptional profiling study comparing the transcriptomes of >90 gastric cancer samples, the most striking feature was their inherent molecular heterogeneity (11). Both subtypes of gastric cancer have been linked to Helicobacter pylori in epidemiological studies. The intestinal type in particular progresses via a sequence of premalignant lesions, chronic gastritis, atrophic gastritis, intestinal metaplasia, and dysplasia- (12, 13, 14), of which each has been independently linked epidemiologically to infection with the pathogen. The chronic inflammation induced by H. pylori very likely provides the setting in which gastric cancer initiation can occur. Mouse models of H. pylori infection have been widely used to study certain aspects of its pathogenesis, such as the virulence factors allowing it to colonize the hostile niche of the gastric environment (15). For investigating the mechanisms underlying Helicobacter-induced gastric pathology, however, the closely related Helicobacter felis provides a more useful model system. In TH1-polarized mice such as the C57BL/6 strain, H. felis induces a rapid proinflammatory and adaptive immune response that is reminiscent of the human setting (16, 17). In the TH2-polarized BALB/c strain of mice, in contrast, the infection induces gastric-organized lymphoid tissue (MALT), which can progress to malignant gastric B cell lymphoma (18, 19, 20, 21). The most severe outcome reported for experimental murine H. felis infection is in situ carcinoma, which develops if infected mice are maintained on a high salt diet or are genetically modified to be hypergastrinemic due to expression of the human gastrin transgene under the control of the insulin promoter (22, 23). In humans, the H. pylori-infected gastric mucosa is characterized by high levels of proinflammatory cytokines including IL-8, IL-1β, TNF-α, and IL-6 (24, 25). The signature cytokines of TH1-polarized cellular immune responses, IFN-γ, IL-12, and IL-18, are also present at elevated levels (26, 27). Despite the production of large amounts of both types of cytokines and the efficient recruitment of neutrophil granulocytes, macrophages, and various lymphocyte populations to the site of infection, the immune response of the host is typically inadequate to clear the infection. Rather, above normal production of inflammatory cytokines, for example due to polymorphisms in their promoter regions, has been linked to an increased risk of gastric cancer (25, 28, 29). In this study, we demonstrate that IFN-γ plays a key (dual) role in the response to Helicobacter infection. Using experimental infection models in wild-type and various knockout strains as well as adoptive transfer and vaccination models, we show that IFN-γ produced by CD4+CD25− effector cells is crucial for the control of Helicobacter infection on the one hand, and induces preneoplastic changes of the gastric mucosa on the other. We further show that even genetically virtually identical animals differ in their ability to mount strong IFN-γ responses to the infection and that the extent of the IFN-γ response determines gastric cancer risk. All mice (C57BL/6, IFN-γ−/− Bl6, TCR-β−/− Bl6, and Rag-1−/− Bl6) were purchased from Charles River Laboratories and bred at a University of Zurich specific pathogen-free facility. Mice were housed in individually ventilated cages and infected with Helicobacter at 5–6 wk of age. All animal experiments were performed in accordance with institutional policies and have been reviewed and approved by the cantonal veterinary office. The Helicobacter strains used in this study were H. pylori Sydney strain 1 (SS1, originally obtained from A. Lee, University of New South Wales, Sydney, Australia (30)) and H. felis CS1 (ATCC 49179). H. pylori was grown on solid medium on horse blood agar containing 4% Columbia agar base (Oxoid; Basingstoke), 5% defibrinated horse blood (HemoStatLabs), 0.2% β-cyclodextrin, 5 μg/ml trimethoprim, 8 μg/ml amphotericin B, 10 μg/ml vancomycin, 5 μg/ml cefsulodin, and 2.5 U/ml polymyxin B sulfate (all from Sigma-Aldrich) at 37°C for 2 days under microaerophilic conditions. For liquid culture, H. pylori was grown in Brucella broth (Difco) containing 10% FBS (Life Technologies) with shaking in a microaerobic atmosphere at 37°C. Before mouse infections, bacteria were inoculated from frozen stocks onto horse blood plates, incubated for 2 days, and then expanded onto fresh plates and grown for 24 h. Bacteria harvested from these plates were used to inoculate overnight liquid cultures. Cultures were routinely assessed by light microscopy for contamination, morphology, and motility. Infections were performed by oral gavage with 108 bacteria in 100 μl of suspension in Brucella broth. H. felis was grown similarly, except that all antibiotics except for trimethoprim and amphotericin were omitted from the blood plates. Primary cultures of murine gastric epithelial cells were prepared according to a protocol developed by Fujikawa et al. (31). Two days after seeding, the cells were immortalized based on a procedure first described by Tucker et al. (32). Cell clusters were infected with a Moloney murine leukemia virus carrying the temperature-sensitive SV40 large T Ag in the presence of 8 μg/ml polybrene. G418-resistant clones were picked 3 wk later. The epithelial origin of the clone of interest was confirmed by E-cadherin staining. For assessment of epithelial IFN-γ responses, the cells were treated with 0.1, 1, and 10 μg/ml recombinant IFN-γ for 24 h. RNA was extracted and purified over RNeasy columns and subjected to transcriptional profiling using Affymetrix Genechips. Wild-type and IFN-γ−/− mice were vaccinated four times at weekly intervals by oral gavage of 1 mg of whole cell sonicate of H. pylori strain SS1 along with 10 μg of cholera toxin as adjuvant (List Biologicals). Two weeks after the last immunization, immunized and nonimmunized control mice of either genotype were infected with 108 CFU of H. pylori SS1. Mice were sacrificed 2 or 7 wk after challenge and bacterial colonization was assessed by colony count assay as well as ureB-specific PCR on genomic DNA extracted from stomach samples. CD4+CD25− T cells were purified from single- cell suspensions of freshly isolated donor spleens. Immunomagnetic sorting was performed using a CD4+CD25+ T cell purification kit from R&D Systems according to the manufacturer’s instructions. Cell preparations were washed, resuspended in cold RPMI 1640 medium and adoptively transferred into immunodeficient (Rag-1−/− or TCR-β−/− Bl6) hosts by i.v. injection in a 200-μl volume. If not noted otherwise, 300.000 cells were transferred. The recipients were routinely infected 1 day after adoptive transfer. Uninfected as well as infected mice that had not received cells served as controls. Where indicated, CD4+CD25− T cell recipients were not infected and served as additional controls. For depletion of neutrophils, mice were treated with 250 μg of anti-GR-1 Ab (clone RB6-8C5, provided by J. Huelsken, Ecole Polytechnique Federale de Lausanne, Lausanne, Switzerland) three times weekly for the duration of the experiment. Mice were killed at 2 wk, 1 mo, or 3 mo after infection by CO2 inhalation; the stomachs were retrieved and cleaned and the forestomach was removed. The remaining piece containing the corpus and antrum was opened along the lesser curvature and spread out in the form of a trapeze. The tissue was then dissected longitudinally (i.e., from the forestomach/corpus junction down to the antrum/duodenum junction) into six equal, parallel pieces that comprise close to identical proportions of antral and corpus tissue. Of every stomach, the same section (i.e., the right-most, left-most etc.) was designated for the same downstream processing (DNA extraction, histology, etc.) to minimize sampling error. For quantitative assessment of H. pylori colonization, one section of each stomach was transferred to a tube containing Brucella broth and homogenized with an Ultra Turrax homogenizer (John Morris Scientific). Serial dilutions were plated on horse blood plates to determine bacterial loads. For quantitative PCR-based assessment of either H. felis or H. pylori colonization, another sixth of each stomach was subjected to genomic DNA isolation using a DNeasy blood and tissue kit (Qiagen). Genomic whole stomach DNA served as a template for PCR using primers directed against urease and flagellin genes. Primer sequences and PCR conditions are listed in Table I⇓. For quantitative assessment of colonization according to a protocol first described by Stoicov et al. (33), 80 ng of extracted DNA was used for real-time PCR (LightCycler; Roche) with the LightCycler 480 SYBR Green I master kit (Roche). Standards were made by sequential 10-fold dilutions of purified H. felis DNA producing a range from 500,000 to 5 copies per reaction. This is based on the premise that 2 fg of H. felis chromosomal DNA is equivalent to one copy of the H. felis genome (33). Each sample was analyzed in triplicate. For histology, two additional stomach sections of one-sixth each were either fixed in 10% neutral-buffered formalin before paraffin embedding or were embedded in cold OCT medium for cryosectioning. Consecutive paraffin sections were stained with H&E, Giemsa, periodic acid-Schiff, and Alcian blue for grading of histopathological changes. One to two longitudinal sections per mouse spanning the length of the stomach from the forestomach/corpus junction to the antrum/duodenum junction were scored with regard to four histopathological parameters (chronic inflammation, gastric atrophy, intestinal metaplasia, and mucus pit cell/epithelial hyperplasia) based on the features described in the updated Sydney classification (34). We attributed scores on a scale of 0–6 as proposed by Chen et al. (35). Specifically, the definition of scores was as follows for the four parameters evaluated. Scores for chronic inflammation were: 0, none; 1, some infiltrates; 2, mild (few aggregates in submucosa and mucosa); 3, moderate (several aggregates in submucosa and mucosa); 4, marked (many big aggregates in submucosa and mucosa); 5, nearly the entire mucosa contains a dense infiltrate; and 6, entire mucosa contains a dense infiltrate. Scores for atrophy were: 0, none; 1, foci where a few gastric glands are lost or replaced; 2, small areas in which gastric glands have disappeared or been replaced; 3, <25% of gastric glands lost or replaced; 4, 25–50% of gastric glands lost or replaced; 5, >50% of gastric glands lost or replaced; and 6, only a few small areas of gastric differentiated glands remaining. For intestinal metaplasia, the scores were: 0, none; 1, only one crypt replaced by intestinal epithelium; 2, one focal area (one to four crypts) replaced; 3, two separate foci with metaplasia; 4, multiple foci; 5, >50% of gastric epithelium replaced by i.e. ; and 6, only a few small areas of gastric epithelium are not replaced by intestinal epithelium. For hyperplasia, the scores were: 0, none; 1, single glands (next to infiltrate); 2, one focal area/one to four crypts (mild); 3; one to three foci; 4, multiple foci; 5, >50% of glands affected; and 6, only few small nonhyperplasic areas. For staining of cells in the S phase (actively proliferating cells) by BrdU incorporation, animals received 10 μl of 10 mM BrdU/g of bodyweight i.p. 60 min before sacrifice. Paraffin sections of 4 μm were stained with anti-BrdU Ab according to instructions provided with an In Situ Cell Proliferation Kit (Roche) and counterstained with a proliferating cell nuclear Ag-specific biotinylated Ab (PCNA;4 1/10 dilution, mouse clone PC10; Zymed Laboratories). Detection was either performed histochemically with HRP-coupled streptavidin (Jackson ImmunoResearch Laboratories) and diaminobenzidine substrate (Research Genetics/Invitrogen) or with Alexa Fluor 594-coupled streptavidin for fluorescence microscopy. For staining of the CD4 surface marker, frozen 5-μm sections were dried overnight, fixed briefly in acetone, dried for several more hours, and stained with a FITC-coupled CD4-specific Ab (1/25, rat clone RM4-5; BD Pharmingen/BD Biosciences). Parietal cells were visualized by Alexa Fluor 594-coupled streptavidin, which binds to the abundant biotin found in this cell type. Cryosections were mounted in 4′,6-diamidino-2-phenylindole-containing mounting medium to visualize nuclei in blue (Vector Laboratories). For conventional and real-time RT-PCR of IFN-γ, IFN-inducible protein 10 (IP-10), MIP-2, and GAPDH, total RNA was isolated from one-sixth of every stomach (antrum and corpus) using RNeasy Mini columns (Qiagen). In brief, 1.5 μg of total RNA was used for first-strand cDNA synthesis with Superscript Reverse Transcriptase III (Invitrogen). The resulting cDNA served as a template for PCR (for conditions and primer sequences, see Table I⇑). IFN-γ-specific real-time PCR (LightCycler; Roche) was performed with a LightCycler 480 SYBR Green I master kit (Roche). Absolute values of IFN-γ expression were normalized to GAPDH expression. For quantitative assessment of IFN-γ gastric protein levels, an IFN-γ ELISA (Quantikine Immunoassay System; R&D Systems) was performed using gastric mucosal extracts according to the manufacturer’s instructions. For transcriptional profiling analysis, total RNA was isolated from homogenized samples of scraped mucosa from one-sixth of every stomach (antrum and corpus) using TRIzol reagent (Invitrogen). After the extraction procedure, the RNA was cleaned up by a RNeasy Mini Kit (Qiagen) and RNA integrity was verified by capillary gel electrophoresis using a Bioanalyzer (Agilent Technologies). Reverse transcription was performed with 2 μg of total RNA and the obtained cDNA was subjected to synthesis and biotin labeling of cRNA using Affymetrix GeneChip One-Cycle Target Labeling and Control Reagents according to the manufacturer’s protocol. Ten micrograms of the cRNA/sample was hybridized for 16 h at 45°C to Affymetrix GeneChip Mouse Genome arrays 430.2, which contain ∼45,000 probes representing the entire mouse genome. After hybridization, the arrays were washed and stained with streptavidin-conjugated PE in a GeneChip Fluidics Station 400 (Affymetrix) and were scanned with a Hewlett-Packard Scanner. Raw gene expression data generated by the GeneChip Operating Software (Affymetrix) were normalized for all probe sets on the array using the Robust Multichip Average method. The expression values were imported into the Resolver application (Rosetta Biosoftware) for hierarchical clustering. Sample clustering was performed based on the present genes only, with a gene being called present if its average expression in the study was above 25. We used the correlation of the log 2 expression values as the measure of similarity of samples and Ward’s minimum variance rule for the merging of cluster branches. The correlation coefficient between each probe set and the IFNG gene (represented by the probe set 1425947_at) was also computed using the log 2 expression values. Although we computed the correlation coefficient for all probe sets, we report only those probe sets with an average expression above 25. Probe sets that did not meet this criterion were considered absent. The differential expression of genes upon IFN-γ treatment was assessed in immortalized primary cells. We report the magnitude of the differential expression in the conditions “average IFN-γ treated” and “untreated” as the average difference of the log 2 values in the two conditions. The differential expression is only reported for probe sets that were declared present (average expression above 25) in one of the two conditions. The myeloperoxidase assay was adapted from Mota et al. (36). One-sixth of every stomach was homogenized in 50 mM potassium phosphate buffer (pH 6.0) containing 0.5% hexadecyl trimethyl ammonium bromide (H5882; Sigma-Aldrich). Homogenates were then subjected to four cycles of freezing in liquid nitrogen and thawing at room temperature. After a subsequent centrifugation step at 4°C for 20 min, the supernatants were collected and their protein content was quantified. Forty micrograms of total protein was analyzed for myeloperoxidase activity in a final reaction volume of 300 μl containing 65 mM potassium phosphate/0.5% hexadecyl trimethyl ammonium bromide, 1.6 mM tetramethylbenzidine (T2885; Sigma-Aldrich), and 0.3 mM H2O2. Absorbance was measured photometrically at 655 nm. Most statistical analysis was performed by Student’s t test or Mann-Whitney U test using GraphPad Prism software, as indicated in the figure legends. For computing the strength and the significance of the statistical dependence of colonization levels and IFN-γ expression, we used Pearson’s correlation coefficient. Calculating the statistical dependence of IFN-γ expression on each of the histological categorizations (chronic inflammation, atrophy, metaplasia, hyperplasia) required using a test for conditional independence described by Hothorn et al. (37). To assess the effects of chronic H. felis infection of male C57BL/6 mice on the gastric mucosa, 20 mice were infected and monitored in a temporal manner with respect to colonization levels and gastric pathology. Since H. felis does not readily form colonies, colonization was examined by visual inspection of Giemsa-stained sections and by PCR using two different sets of H. felis-specific primers targeting the flaB and ureB genes. The primer combination amplifying parts of the flaB gene was further used for quantitative PCR to determine the absolute number of H. felis bacteria per stomach as previously described (33). Quantitative histopathological analysis was performed on H&E-, Giemsa-, periodic acid-Schiff-, and Alcian blue-stained tissue sections based on the features described in the updated Sydney classification (34), with a quantitative scoring system as devised by Chen et al. (35). At 3 mo after infection, the bacteria were readily detectable in histological sections (data not shown) and by PCR (Fig. 1⇓A), with bacterial densities ranging from 104 to 106 bacteria per stomach. Extensive infiltration of the infected mucosa and submucosa by various immune cell populations was observed (H&E staining, Fig. 1⇓B, top middle, right, and bottom panels), which is consistent with a diagnosis of chronic active gastritis. H&E staining further revealed cells that histologically resemble intestinal goblet cells (Fig. 1⇓B, top middle panel) in several mice at this early time point; these cells are strongly stained also by Alcian blue (which stains neutral, sulfated mucopolysaccharides; Fig. 1⇓D). The appearance of intestinal-like cells is accompanied by the partial or complete loss of terminally differentiated gastric cells of the parietal and chief cell lineages, thereby fulfilling the criteria for the diagnosis of gastric atrophy or atrophic gastritis (Fig. 1⇓B, top middle and bottom panels). Alcian blue-positive metaplasia is mostly found in the proximal third of the corpus, i.e., close to the forestomach junction, at this early time point; the distal corpus is populated by a rapidly proliferating, PCNA-positive and BrdU-incorporating cell type (Fig. 1⇓C, lower panel) that morphologically resembles the progenitor of surface mucus (pit) cells. In an uninfected age-matched stomach, PCNA-positive cells (i.e., gastric stem cells or their immediate progeny) reside exclusively in a narrow band of mucosa termed the isthmus, at a density of two to four cells per gland (Fig. 1⇓C, upper panel). In contrast, in chronically infected mice, the entire gland is sometimes found to be PCNA and BrdU positive from the base to the tip. The overrepresentation of this PCNA-positive, rapidly cycling progenitor cell is consistent with a diagnosis of compensatory epithelial hyperproliferation, also termed foveolar hyperplasia or mucus pit cell hyperplasia. Overall, at 3 mo after infection, the predominant histopathological lesions observed are moderate to marked atrophy, moderate epithelial hyperplasia, and evidence of beginning intestinal metaplasia in the proximal part of the corpus (Fig. 1⇓B, lower panel), all of which are recognized precursor lesions of gastric cancer. Although metaplasia and hyperplasia usually affect different regions of the corpus within the same infected animal, both types of lesions can sometimes be found in the same gland (Fig. 1⇓D, lower panel). In these cases, their localization in the gland relative to each other suggests that hyperplastic cells arise from progenitors migrating from the isthmus toward the stomach lumen (i.e., surface mucus cell progenitors), whereas metaplastic cells arise from progenitors of those lineages that differentiate as they migrate toward the base of the gland, i.e., parietal or chief cells. Male C57BL/6 mice infected with H. felis for 3, 6, 9, and 12 mo develop gastric inflammation and preneoplastic pathology. A, Quantitative assessment of H. felis colonization by PCR directed against the flaB and ureB genes using whole stomach genomic DNA as template. Real-time results for the flaB PCR are shown in triplicate with errors bars above the gel photographs for both PCRs for all five infected and two uninfected mice per time point. The color code indicates the duration of infection. B, Histopathological analysis of gastric tissue. H&E-stained sections are shown for a representative uninfected (left panel) and two 3-mo infected mice (middle and right panels). Histopathological scores are shown on a scale of 0–6 for four parameters: chronic inflammation, atrophy, intestinal metaplasia, and hyperplasia. Every mouse was scored; scores for all five infected mice per time point are shown along with the mouse identification. Uninfected control mice were scored as well; all scores were 0 (data not shown). The color code is the same as in A. C, H. felis infection induces epithelial hyperplasia. BrdU- and PCNA-stained sections from the corpus of two representative control and infected mice are shown. In an uninfected stomach, actively proliferating progenitor cells populate a narrow band in the isthmus; in contrast, in a chronically infected stomach, this proliferative zone can expand to include the entire gland. D, PCNA and Alcian blue costaining of an uninfected control and an infected mouse reveals localization of hyperplastic cells (brown nuclei) in the luminal half of the gland, whereas metaplastic cells (blue) are found at the base of the gland. At the later time points of the study (6, 9, and 12 mo postinfection), bacterial colonization decreased progressively in the majority of mice (Fig. 1⇑A). This decrease in bacterial densities was accompanied by a slight overall increase in the surface area of the corpus affected by marked pathology (Fig. 1⇑B, lower panel), but progression to carcinoma was not observed in the time frame of our study. Notably, however, we found that in two of the four time points, several animals did not fit into the overall pattern (i.e., animals 3.5. and 9.5., Fig. 1⇑, A and B). These mice were colonized at very high levels (>105 bacteria/stomach), but had minor or no evidence of preneoplastic epithelial changes (Fig. 1⇑B, bottom panel). Atrophy was not detected; instead, the gastric mucosa of the mice was characterized by aggregates of lymphocytes confined to few, very restricted areas. The surrounding mucosa was normal with respect to its cellular composition. These exceptional mice therefore differed substantially from their littermates in that they were protected from gastric pathology despite harboring high bacterial loads. Because Th1-polarized T cells and their signature cytokine IFN-γ had been implicated before in H. pylori-induced gastritis (38), we hypothesized that this cytokine might be differentially regulated in mice differing with respect to gastric pathology. We analyzed local gastric IFN-γ expression in all of the mice of the time course shown in Fig. 1⇑ by ELISA (Fig. 2⇓A) as well as conventional and real-time RT-PCR (Fig. 2⇓B). Strong IFN-γ production was detected only in those mice that had successfully reduced bacterial colonization and had significant associated immunopathology. In contrast, the exceptional mice 3.5 and 9.5 of the time course study (marked by red asterisks, Fig. 2⇓, A and B) failed to mount a measurable IFN-γ response, as determined at both the RNA and protein levels. The other striking difference between the two groups of mice was their pattern of gastric infiltration by CD4+ T cells (Fig. 2⇓C). Whereas these cells were found to be confined to large mucosal aggregates in highly colonized mice (Fig. 2⇓C, right panel), they were more diffusely distributed in the group of mice characterized by low bacterial counts and severe epithelial pathology (Fig. 2⇓C, left panel). In this group, the T cells infiltrated the entire lamina propria from the base to the tip of the gland in small groups or as single cells, suggesting that this type of CD4+ T cell mediates bacterial clearance and induces epithelial changes. Parietal cells (in orange, Fig. 2⇓C) were almost completely absent from the stomachs infiltrated in this manner, but are found in normal numbers in the highly colonized mice. Interestingly, the effects of diffusely infiltrating T cells often are extremely localized, i.e., hyperplasia and metaplasia are found only in glands directly adjacent to these infiltrates (data not shown). Overall, the differences between mice with or without pathology suggest that a soluble factor secreted by lamina propria-infiltrating T cells, possibly IFN-γ, induces the preneoplastic changes characteristic of H. felis- infected C57BL/6 mice. Gastric IFN-γ production and CD4+ T cell infiltration patterns are indicative of colonization levels and pathology. A, IFN-γ ELISA revealing gastric IFN-γ production in uninfected (uninf) and infected mice 3, 6, 9, and 12 mo after infection. The animals shown are the same as in Fig. 1. B, Gastric IFN-γ transcript levels as determined by conventional (bottom panels) and real-time (upper panels) RT-PCR are shown for each animal of the time course, with GAPDH levels serving as loading controls and for normalization of real-time IFN-γ expression. Mice marked with a red asterisk have lower IFN-γ transcript levels than the other members of their groups. The color code is the same in A and B and also the same as in Fig. 1. C, Mice with severe pathology are characterized by CD4+ T cells (in green) infiltrating diffusely into the lamina propria (e.g., mouse 3.4., left panel). In contrast, a mouse with little or no epithelial changes displays clusters of CD4+ T cells that resemble lymphoid follicles (mouse 3.5., right panel). The absence of parietal cells (orange) indicates gastric atrophy. To assess the association of IFN-γ expression and gastric pathology on the one hand and the possible inverse relationship of IFN-γ levels with Helicobacter colonization on the other in a more representative group of animals, we analyzed 18 additional C57BL/6 mice infected with H. felis for 3 mo with respect to colonization (Fig. 3⇓A), IFN-γ expression (Fig. 3⇓B), and gastric histopathology (Fig. 3⇓C). Interestingly, we found that colonization and IFN-γ expression were indeed anticorrelated, with a Pearson’s correlation coefficient of −0.95 and an associated p value of 9.78−10 (Fig. 3⇓D). IFN-γ levels were further significantly associated with chronic inflammation, atrophy, and epithelial hyperplasia (p values of 0.0196, 0.0204, and 0.0344) and less closely linked to the appearance of metaplasia (p = 0.177; Fig. 3⇓D). From these calculations, we conclude that local IFN-γ expression is indeed a useful indicator of a successful reduction of bacterial burden, as well as a valid predictor of gastric premalignant changes triggered by Helicobacter infection. Gastric IFN-γ production is inversely correlated with Helicobacter colonization and determines gastric preneoplastic pathology. Eighteen mice were infected with H. felis for 3 mo. A, H. felis colonization levels as determined by flaB real-time PCR are shown in triplicate with errors bars above the gel photographs for flaB and ureB PCR for all 18 mice (numbered). B, Normalized gastric IFN-γ expression as determined by real-time PCR is shown for the same mice as in A. C, Histopathology scores for the four parameters indicated in the legend are shown for all 18 mice. D, Normalized IFN-γ expression is plotted as a function of H. felis colonization (top panel) as well as the scores for the four parameters (lower panels; each dot represents one mouse). Colonization and IFN-γ expression are anticorrelated with a Pearson’s correlation coefficient of −0.95 and an associated p value of 9.78−10. The p values indicating the significance of the correlation of IFN-γ expression with the histopathological parameters were calculated as described in Materials and Methods and are also shown. To assess whether the histopathological differences between the two groups of mice responding differentially to Helicobacter infection translate into transcriptionally evident differences, we performed gene expression profiling using Affymetrix Genechips. RNA was purified from scraped mucosal samples of an independent set of H. felis-infected mice that were chosen because they had developed uniform pathology of either of the three following types rather than a mixture of all three: 1) symptoms of gastritis, but no epithelial changes; 2) atrophic gastritis accompanied by epithelial hyperplasia only; or 3) atrophic gastritis accompanied by intestinal metaplasia only. An uninfected control group was also included in the analysis, as were two groups of mice that lacked mature T and B cells due to a deletion mutation in the rag-1 gene (Rag-1−/−) and that were either experimentally infected or served as Rag-1−/− uninfected controls. Infected Rag-1−/− mice showed no signs of gastritis despite high colonization levels. An unsupervised hierarchical clustering approach, which deliberately does not take into account the histopathological information we had on the mice, revealed the segregation of inflamed, but nonatrophic (i.e., no epithelial changes) samples from those characterized by hyperplasia or metaplasia (Fig. 4⇓A). Interestingly, the latter two were also significantly different from each other to drive their segregation into two distinct branches of the dendrogram tree. All control samples are found in a separate branch. These cluster along with the samples of infected as well as uninfected Rag-1−/− mice, reflecting the complete lack of gastric inflammation in this genetic background (Fig. 4⇓A). Indeed, the transcriptional changes between infected and uninfected Rag-1−/− mice affected only a small number of genes and were thus insufficient to drive clustering into distinct groups. In conclusion, the clustering of histologically similar samples into distinct branches of the dendrogram tree suggests distinct pathogenetic pathways for hyperplastic and metaplastic lineages and provides transcriptional signatures of these lesions (publicly accessible under http://www.ncbi.nlm.nih.gov/geo/query/acc.cgi?acc = GSE13873) that can now be mined for clues to their cellular and pathogenetic origin. 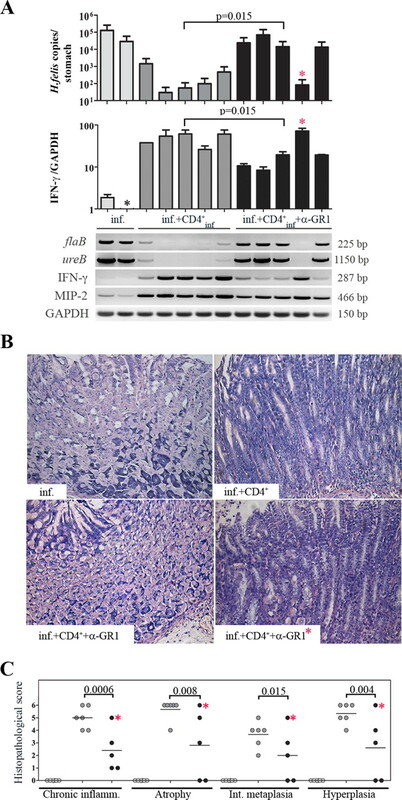 IFN-γ expression is high in murine hyperplastic mucosa, but not in metaplastic mucosa or mucosa that is inflamed, but has not undergone epithelial changes. A, Gene expression profiling segregates samples representing uninfected (uninf) gastric mucosa from those of infected (inf) mucosa displaying gastritis and from those of infected mucosa with a predominantly hyperplastic or metaplastic phenotype. RNA was extracted from the scraped mucosa of mice that displayed uniform pathology of either of the three types, reverse transcribed, and hybridized to Affymetrix Genechips. Hierarchical clustering of the samples was performed using Rosetta Resolver software. Sample identities (four to five mice per group) are noted below the respective branches of the dendrogram tree. B, Averages of signals corresponding to the IFN-γ probe on the array, as calculated for every histopathologically defined group of five infected mice. Error bars and p values (Mann-Whitney U test) are also shown. C, Conventional and real-time RT-PCR of IFN-γ-, IP-10-, and GAPDH-specific transcripts performed on five infected mice per histological group as shown in A and B. Triplicates were measured and error bars are shown. The p values were calculated by the Mann-Whitney U test. The color code is the same in B and C. D, All genes present on the array were assessed in terms of their 1) regulation by IFN-γ in an immortalized murine gastric epithelial cell line and 2) their correlation of expression with IFN-γ across the arrays shown in A. Differential expression upon IFN-γ treatment is plotted on the x-axis in log2 scale and the coefficient of correlation with IFN-γ expression in vivo is plotted on the y-axis. Genes called present in the in vitro study (IFN-γ treatment of cells) are shown in green and genes called present in the murine mucosa (comparison of mice with various degrees of pathology, see A) are shown in dark blue. Genes called present in both data sets are shown in turquoise. Those genes for which the correlation coefficient was >0.4 and the log 2 ratio was >0.8 were selected and are shown in red, which indicates their induction upon IFN-γ treatment in vitro and their correlation with IFN-γ expression in vivo. This subset of genes therefore is likely induced by IFN-γ in vivo. All arrays hybridized in the course of the two studies are publicly accessible on the National Center of Biotechnology Information GEO web site (http://www.ncbi.nlm.nih.gov/geo/query/acc.cgi?acc=GSE13873). The p value indicating that the high-response probes are overrepresented in the high-correlation probes (as computed by Fisher’s exact test) is 3.45 × 10−67. Strikingly, the expression of IFN-γ was strongest in the hyperplastic group as judged by the signal intensities of the corresponding probe sets on the array (Fig. 4⇑B). As expected, nonatrophic gastritis samples did not express IFN-γ (Fig. 4⇑B), confirming our previous observations (Figs. 2⇑ and 3⇑). Interestingly, the metaplastic samples also showed significantly less IFN-γ production than hyperplastic samples, suggesting that hyperplasia is the dominant lesion induced by local IFN-γ production (Fig. 4⇑B). This was confirmed by IFN-γ-specific conventional RT-PCR as well as real-time RT-PCR performed on the same set of animals (Fig. 4⇑C). Real-time and conventional RT-PCR designed to amplify a known target gene of the IFN-γ signaling pathway, the chemokine IP-10 (also known under the name CXCL-10) was also performed and revealed a virtually identical pattern of expression (Fig. 4⇑C). In summary, we conclude from the two independent experiments described in Figs. 3⇑ and 4⇑ that local IFN-γ production is significantly associated with the induction of hyperplastic, but not metaplastic lesions as a result of the infection, again suggesting that the pathogenetic origins of these two premalignant lineages are probably distinct. Aside from the known IFN-γ target IP-10, the expression patterns of numerous genes correlate with the expression of IFN-γ in our data set (for a list of all genes represented on the array and their correlation with IFN-γ expression, see supplemental Table I5). In an effort to identify genes that are not only correlated, but induced directly by this cytokine, we generated an immortalized cell line from primary murine gastric epithelial cells and treated these cells with increasing concentrations of recombinant murine IFN-γ for 24 h. mRNA extracted from these cells was then subjected to transcriptional profiling analysis using Genechips. All genes on the array were then analyzed for their correlation with IFN-γ on the one hand (first data set, dark blue spots in Fig. 4⇑D) and their induction by IFN-γ on the other (second data set, green spots in Fig. 4⇑D; turquoise spots indicate representation in both data sets). Interestingly, the vast majority of all 286 genes found to be strongly induced by IFN-γ in vitro were also correlated with IFN-γ in vivo (red spots), suggesting that these genes are induced by IFN-γ in vivo (for a list of these genes, see supplemental Table II). Since IFN-γ production is correlated with both a reduction in bacterial burden and induction of preneoplastic epithelial changes, we assessed both in an IFN-γ-deficient background. For quantification of bacterial colonization, C57BL/6 wild-type and IFN-γ−/− mice were infected with H. pylori strain SS1, a mouse-adapted patient isolate that readily forms colonies and can also be subjected to H. pylori-specific semiquantitative PCR using a primer combination amplifying the urease subunit B gene (ureB) from gastric genomic DNA. IFN-γ−/− mice were colonized more heavily than wild type at 4 and 12 wk after infection, and this difference was significant at both time points (Fig. 5⇓, A and B). In contrast, the colonization levels were reversed at 2 wk after infection, suggesting that the defect of the IFN-γ−/− strain with respect to clearance becomes evident only after an adaptive immune response starts to take effect. These findings suggest that IFN-γ is critical for the control of Helicobacter infection during the adaptive phase of the immune response. IFN-γ is crucial for the efficient reduction of H. pylori burden and for the development of H. felis-induced premalignant lesions. A and B, Wild-type (WT) C57BL/6 mice (○) and IFN-γ−/− Bl6 mice (▵; four to seven mice per group) were infected with H. pylori SS1. Colonization was assessed by colony counting (A) and H. pylori-specific PCR using ureB-directed primers (B) at 2 wk, 1 mo, and 3 mo after infection. Counts and PCR results are shown along with p values indicating significance of the findings as determined by the Mann-Whitney U test (A). C, Giemsa-stained sections are shown for representative C57BL/6 wild-type and IFN-γ−/− mice infected for 3 mo with H. felis along with uninfected controls. D, Histopathology scores for four histopathological parameters (as indicated) for a total of 30 wild-type and 18 IFN-γ−/− mice included in three independent studies. Values of p as calculated by Student’s t test indicate the statistical significance of the differences. Thin bars in A and D indicate the means. Interestingly, IFN-γ−/− mice were further protected from preneoplastic changes induced by 3 mo of H. felis infection in three independent studies comparing them to wild-type mice (Fig. 5⇑, C and D). They were significantly less likely than wild- type mice to develop gastritis, atrophy, hyperplasia, or metaplasia (with p values of 0.0002, 0.0004, 0.0001, and 0.045, respectively). This observation suggests that the preneoplastic phenotype induced by Helicobacter infection in the C57BL/6 background depends on IFN-γ production. Helicobacter cannot be cleared spontaneously in mice or humans. We were therefore interested in testing the relevance of IFN-γ in a true clearance model. For this purpose, we used a vaccine regimen consisting of four consecutive weekly doses of 1 mg of H. pylori SS1 sonicate plus 10 μg of cholera toxin followed by challenge with the same strain 2 wk after administration of the last dose. This regimen leads to a significant reduction in bacterial burden by two orders of magnitude, from 105 to 106 CFU/stomach to 103–104 CFU/stomach (Fig. 6⇓B) in most wild-type mice. Immunized/challenged wild-type mice produce IFN-γ at significantly higher levels than immunized controls or mice from a control group that was infected without prior immunization, as assessed by conventional and real-time RT-PCR (Fig. 6⇓A). This is further reflected in the transcript levels of IP-10, a downstream mediator of IFN-γ (Fig. 6⇓A). In contrast to the successful clearance of H. pylori SS1 from stomachs of immunized wild-type mice, IFN-γ−/− mice receiving the same vaccine were significantly less capable of clearing the infection (Fig. 6⇓B; p = 0.0014), implying that a strong IFN-γ response is crucial for vaccination-induced protection. 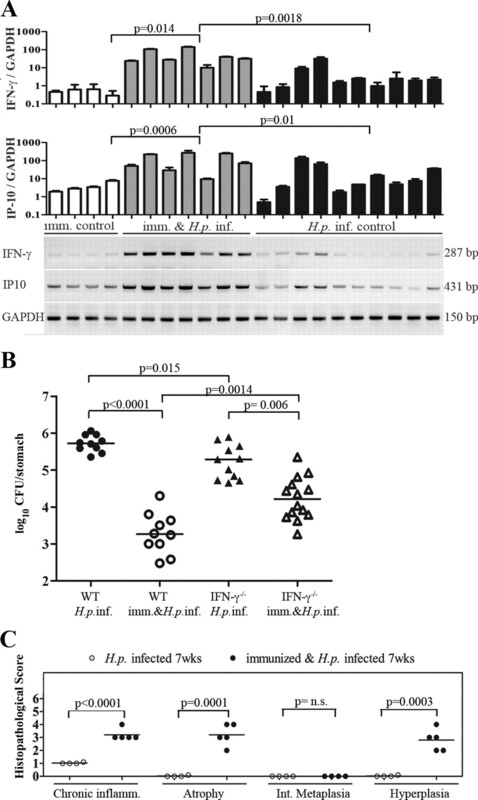 IFN-γ is induced upon and required for efficient vaccination against H. pylori (H.p.). Vaccinees were immunized four times in weekly intervals with 1 mg of H. pylori sonicate in conjunction with 10 μg of cholera toxin and challenged with H. pylori strain SS1 2 wk after the last immunization. Colonization was determined 2 wk (A and B) or 7 wk (C) after challenge. A, IFN-γ and IP-10 levels were assessed by conventional (lower panels) and real-time (upper panels) RT-PCR for a group of immunized (imm&H.p.inf.) and challenged (inf.) wild-type (WT) C57BL/6 mice, a group of immunized, but uninfected (imm. control) mice and a group of control-infected mice (inf. control), respectively. GAPDH levels served as loading controls and for normalization of IFN-γ expression. B, Colony counts of 10 wild-type and 14 IFN-γ−/− mice (imm.&H.p.inf.) that were immunized as described above. Ten additional wild-type and 11 additional IFN-γ−/− mice served as infection controls (inf.). The p values were calculated using the Mann-Whitney U test. Thin bars indicate the medians. C, Histopathology scores of five immunized wild-type C57BL/6 animals 7 wk after challenge with SS1 compared with four mice that were infected without prior vaccination for 7 wk. The p values indicate significant differences for three of the parameters scored; metaplasia was not observed in any of the mice. Thin bars indicate the means. n.s., Not significant. IFN-γ is known to act on numerous immune and nonimmune cell populations. Best understood is its effect on macrophages, which are rendered highly bactericidal and are induced to efficiently present Ag in the context of MHC class II upon exposure to IFN-γ (39). We assessed the role of macrophages on clearance in our vaccine model by depleting them with liposome-encapsulated chlodronate (a bisphosphonate toxin; data not shown) during the challenge phase of our immunization protocol. Despite efficient depletion of macrophages from the spleen under these circumstances (40), we saw no negative effects on clearance, suggesting that macrophages are dispensable for the effector phase of Helicobacter clearance (data not shown). Vaccination with H. pylori sonicate and cholera toxin reduces the bacterial burden, but does not eliminate the infection entirely (Fig. 6⇑B). The residual colonization is of concern, as it may foster a chronic immune response in the stomach that is more virulent than the response to the natural infection. To assess the pathology that is triggered by a vaccine-induced response over and above what is induced by infection with the same strain alone, vaccinated/challenged mice were compared with an infected-only group 7 wk after infection (Fig. 6⇑C). The vaccinated group scored significantly higher with respect to inflammation, atrophy, and hyperplasia, while intestinal metaplasia was not detected at this point in time (Fig. 6⇑C). Although vaccine-induced gastric pathology may be transient at least with a weakly immunogenic challenge strain such as SS1 (as has been suggested by Sutton et al. (41)), these results imply that sterile immunity should be the goal of Helicobacter vaccine development efforts. Multiple cell types are known to produce IFN-γ during the early, innate, and the adaptive phases of the immune response to invading pathogens. NK cells have been shown to be an important early source of IFN-γ for example during Legionella pneumophila infection (42). NKT cells as well as subsets of CD4+ and CD8+ T cells are possible sources of IFN-γ during the adaptive phase of the immune response. To assess the role of NK and NKT cells during H. pylori infection, we depleted them in vivo using a mAb directed against their shared NK1.1 surface marker in the course of a 12-day experimental infection. Alternatively, NKT cells were selectively activated in a separate group of mice by i.p. injection of α-galactosylceramide, a known ligand of the semi-invariant Vα14 TCR that is recognized in the context of CD1d molecules on APCs. Neither treatment influenced colonization levels in a significant manner (data not shown), ruling out an important contribution of the two cell types in this experimental infection model. To assess the functional contribution of CD4+ T cells to Helicobacter control and to Helicobacter-induced immunopathology, we used an adoptive transfer model of purified CD4+CD25− T cells into immunodeficient hosts. Rag-1−/− (mature T and B cell-deficient) and TCR-β−/− (lacking the TCR-α/β+ subset of T cells) mice were used interchangeably as recipients in multiple independent experiments and produced identical results. Both strains are essentially protected from Helicobacter-induced gastric pathology due to their defect in mounting a proper T cell response to the infection (Fig. 7⇓C, inf.). Both are colonized at higher levels than wild-type mice (data not shown). Adoptive transfer of ∼300,000 CD4+CD25− T cells isolated from a H. felis-infected wild-type donor spleen induced a significant reduction in bacterial burden (p = 0.05 and 0.009; compare light gray and black bars showing quantitative flaB PCR performed on gastric genomic DNA; Fig. 7⇓, A and B) as early as 4 wk after infection compared with infected controls that had not received cells. Clearance was accompanied by strong gastric IFN-γ responses (assessed by conventional and real-time RT-PCR; Fig. 7⇓, A and B, compare light gray and black bars) and the rapid appearance of premalignant lesions in the stomach (Fig. 7⇓, C, E, and F, inf. + CD4+inf). Both elevated gastric IFN-γ and pathology was strictly dependent on Helicobacter infection of the recipient, as cells from an infected donor had no effect in an uninfected recipient (Fig. 7⇓, A, C, and E, uninf. + CD4+inf). Furthermore, cells isolated from an uninfected donor failed to clear Helicobacter infection in the recipient (Fig. 7⇓B) and were also ineffective in inducing gastric pathology (Fig. 7⇓, C and F, inf. + CD4+uninf) or IFN-γ responses (Fig. 7⇓B). In conclusion, CD4+CD25− T cell-induced clearance and concomitant pathology depends on infection both on the part of the donor and on the part of the recipient, suggesting that the prior priming and correct homing of transferred CD4+CD25− T cells is crucial for both phenotypes. Indeed, staining for the CD4 surface marker reveals massive infiltration of these cells into the (infected) gastric mucosa, where their patterns of lamina propria colonization are strikingly similar to those observed in wild-type mice with severe pathology (Figs. 7⇓D and 2⇑C). Interestingly, production of the murine functional IL-8 analog MIP-2 is independent of infection on the part of the donor (but not the recipient, Fig. 7⇓, A and B), as adoptive transfer of cells from an uninfected donor can trigger MIP-2 expression at similar levels as those from an infected donor. In contrast to the strong effects that adoptive transfer of CD4+ cells has on immunodeficient recipients, we have not observed any such effects upon transfer of purified CD8+ T cell populations, even when much higher numbers of cells were transferred (up to 2 × 106 cells). This result suggests that CD8+ T cells do not contribute to Helicobacter control or gastric pathology in a measurable way in this model. Adoptive transfer of CD4+CD25− T cells into immunodeficient mice induces Helicobacter clearance, strong local IFN-γ and MIP-2 production, and gastric preneoplastic lesions. A, Immunomagnetically purified CD4+CD25− T cells from the spleens of H. felis-infected wild-type donors were adoptively transferred into 6-wk-old Rag-1−/− mice (300,000 cells/mouse), which were subsequently infected with H. felis (inf. + CD4+inf) or remained uninfected (uninf. + CD4+inf) for the duration of the experiment (1 mo). gDNA was isolated from every stomach and used for conventional PCR directed against the flaB and ureB genes of H. felis (lower panels) as well as quantitative flaB PCR (top panel) to determine colonization levels. IFN-γ, MIP-2, and GAPDH transcripts were assessed by conventional RT-PCR (lower panels); IFN-γ was also quantified by real-time PCR (middle panel). Uninfected and H. felis-infected mice that did not receive cells are shown as controls. Values of p as calculated by Mann-Whitney U test are shown for all quantitative comparisons; n.s., not significant. Asterisks indicate values that were below the detection limit. B, In this experiment, the setup was identical to that described in A, except that CD4+CD25− T cells were isolated from infected or uninfected donors, respectively (inf. + CD4+inf or inf. + CD4+uninf) and all recipients were infected upon transfer. The duration of this experiment was 3 mo from the day of adoptive transfer. Again, uninfected and H. felis-infected mice that did not receive cells served as controls. C, Representative Giemsa-stained sections are shown from a mouse that was H. felis-infected (inf. ), but did not receive cells, a mouse that received cells, but remained uninfected (uninf. + CD4+inf), a mouse that received cells from an infected donor and was infected (inf. + CD4+inf), and a mouse that received cells from an uninfected donor and was infected (inf. + CD4+uninf). Only the mouse that received cells from an infected donor and was infected itself developed gastric pathology such as intestinal metaplasia. A quantitative histopathological analysis of all mice included in the studies described in A and B is shown in E and F, respectively. D, Immunofluorescent staining of the CD4 surface marker in cryosections of a representative infected Rag-1−/− mouse (top) and an infected Rag-1−/− recipient of CD4+CD25− T cells isolated from an infected donor (bottom). The adoptively transferred cells migrate to the site of infection and populate the lamina propria in a pattern similar to that observed in wild-type mice with severe pathology. E, Histopathological analysis of all mice of the adoptive transfer study shown in A, with regard to the four parameters: chronic inflammation, atrophy, intestinal metaplasia, and hyperplasia. The study included five infected control mice, four uninfected recipients of CD4+CD25− T cells, and five infected recipients of CD4+CD25− T cells; two uninfected control mice that did not receive cells are not shown. Their histopathology scores were all 0. F, Histopathological analysis of all mice of the adoptive transfer study shown in B, with regard to the four parameters: chronic inflammation, atrophy, intestinal metaplasia, and hyperplasia. The study included four infected control mice, three infected recipients of CD4+CD25− T cells from an uninfected donor, and six infected recipients of CD4+CD25− T cells from an infected donor; again, two uninfected control mice that did not receive cells are not shown, because their histopathology scores were all 0. The two studies shown in E and F are representative of several similarly designed studies that were conducted in either the Rag-1−/− or TCR-β−/− backgrounds. The statistical significance of all comparisons as calculated with Student’s t test is indicated by p values; n.s., not significant. Thin bars in E and F indicate the means. The color code is the same in A and E and in B and F.
The control of Helicobacter by CD4+CD25− effector T cells in the adoptive transfer model is accompanied by the production of large quantities of local IFN-γ (Fig. 7⇑, A and B). To assess the contribution of effector T cell-derived IFN-γ to bacterial clearance and concomitant immunopathology, we adoptively transferred wild-type or IFN-γ−/− CD4+CD25− effector T cells from infected donors into immunodeficient Helicobacter-infected hosts. Whereas the recipients of wild-type cells efficiently cleared the infection, the recipients of IFN-γ−/− cells were still heavily colonized 4 wk later (Fig. 8⇓A showing flaB- and ureB-specific PCRs and quantitative flaB PCR performed on gastric genomic DNA), suggesting that IFN-γ production by effector T cells is essential for clearance. Indeed, IFN-γ expression in gastric tissue of IFN-γ−/− cell recipients was minimal (Fig. 8⇓A, middle panel), implying that CD4+CD25− effector T cells are the main producers of the cytokine in this setting. In contrast, the neutrophil chemoattractant MIP-2 was detectable in moderate amounts also in the gastric mucosa of IFN-γ−/− cell recipients, suggesting that it is produced (or induced) also by IFN-γ−/− T cells (Fig. 8⇓A). This observation led us to quantify the levels of neutrophil infiltration in all groups of mice by an assay measuring the activity of myeloperoxidase, an enzyme produced in large quantities by neutrophils and, to a lesser extent, monocytes and macrophages. Gastric neutrophil infiltration proved to be clearly dependent on adoptively transferred CD4+CD25− effector T cells, as there was only minor infiltration due to infection alone (Fig. 8⇓B). However, neutrophil infiltration was virtually identical in the two groups that had received wild-type or IFN-γ−/− T cells, suggesting that IFN-γ does not affect neutrophil recruitment, but may rather act by modulating neutrophil phagocytic or microbicidal activity, survival, or other characteristics. IFN-γ produced by adoptively transferred CD4+CD25− T cells is essential for efficient clearance of Helicobacter. Six-week-old immunodeficient TCR-β−/− mice received 350,000 immunomagnetically purified CD4+CD25− T cells from infected wild-type (WT) or IFN-γ−/− donors as indicated. The recipients were infected (inf.) with H. felis 1 day later and were sacrificed 1 mo later. Infected TCR-β−/− mice that had not received cells served as controls. All tissues were analyzed as described in the legend to Fig. 7. A, Colonization and transcript levels as determined by conventional and real-time PCR or RT-PCR. Only mice that have received wild-type CD4+CD25− T cells are able to clear the infection and launch a strong IFN-γ response. Asterisks indicate values that were below the detection limit. Values of p were calculated the by Mann-Whitney U test. B, Myeloperoxidase assay reflecting the influx of neutrophils and, to a lesser extent, monocytes and macrophages into the gastric mucosa. Duplicate readings were performed for extracts of every mouse and averages as well as SDs are plotted. A representative myeloperoxidase assay of three is shown. The animals plotted are the same as in A; three uninfected mice and two additional infected mice are also included. Values of p were calculated using Student’s t test. C, Histopathological analysis of the study shown in A and B (lower panel, 350,000 cells transferred) as well as an independent study using fewer cells (upper panel, 50,000 cells transferred). Group sizes ranged from four to seven mice. Values of p were calculated using Student’s t test. Thin bars in C indicate the means. The color code is the same in A–C. Two representative experiments of three are shown. n.s., Not significant. We further assessed the role of effector T cell-derived IFN-γ in Helicobacter-associated gastric pathology as a function of the number of transferred cells. In an experiment in which we adoptively transferred only 50,000 cells into immunodeficient mice, we saw a significant difference in all four histopathological parameters when comparing recipients of wild-type vs IFN-γ−/− cells (Fig. 8⇑C, top panel). In an independent transfer experiment with 350,000 cells, the differences were significant for atrophy and hyperplasia scores, but less clear for metaplasia (Fig. 8⇑C, bottom panel). This result suggests that induction of gastric pathology, especially manifesting as atrophy accompanied by compensatory hyperplasia, largely depends on IFN-γ. The induction of metaplasia, in contrast, seems to be linked less clearly with IFN-γ, a finding that is in line with the less pronounced expression of this cytokine in predominantly metaplastic compared with hyperplastic tissues (Fig. 4⇑, B and C) and the less compelling statistical link between IFN-γ expression and metaplasia compared with hyperplasia scores in wild-type mice (Fig. 3⇑D). Neither H. felis nor H. pylori are cleared spontaneously from experimentally infected mice; therefore, nonvaccine-induced clearance models are not readily available. Our model of clearance/reduction of H. felis upon adoptive transfer of CD4+CD25− T cells provides a system in which effector mechanisms involved in efficient Helicobacter clearance can be studied. Because neutrophils have been implied in phagocytic removal of other mucosal pathogens, we depleted them for the duration of the experiment by treating the mice three times weekly with doses of 250 μg of an Ab targeting the neutrophil-specific surface marker GR-1. Depletion of neutrophils prevented clearance in all but one of five mice (Fig. 9⇓A; the exceptional mouse later turned out not to have responded to the treatment, as neutrophil numbers were normal in the stomach and spleen) compared with a control group in which all five mice had cleared the infection. Interestingly, the gastric IFN-γ production indicative of T cell infiltration was also blocked in all four mice that had failed to clear due to successful Ab treatment (Fig. 9⇓A), suggesting that neutrophils contribute to clearance of Helicobacter at least in part by recruiting more effector cells to the stomach. This reduced gastric infiltration of T cells is reflected also in a significant protection from preneoplasia (Fig. 9⇓, B and C). To rule out that the GR-1 Ab acts directly on activated T cells and depletes them from the gastric mucosa, we monitored gastric T cell levels before and after treatment in immunocompetent mice with preexisting lesions. In this scenario, we did not observe unwanted effects of the Ab treatment on T cells, suggesting that the Ab affects neutrophils only (data not shown). In conclusion, neutrophils play an important role during clearance of Helicobacter by facilitating T lymphocyte recruitment and possibly also by phagocytic removal of luminal bacteria. Neutrophils are essential for Helicobacter clearance in the adoptive transfer model. TCR-β−/− mice received 350,000 CD4+CD25− T cells and were infected with H. felis. Neutrophil depletion was accomplished by three times weekly i.p. injections of 250 μg of GR-1-specific Ab (clone RB6-8C5) for the entire 4-wk duration of the experiment. All but one of the treated mice was devoid of neutrophils in the stomach as well as the spleen as assessed by immunohistochemistry using a GR-1-directed Ab (data not shown) upon termination of the experiment. The exceptional mouse in which the treatment failed is marked by a red asterisk. A, flaB- and ureB-specific (quantitative) PCRs were performed on genomic whole stomach DNA and IFN-γ, MIP-2, and GAPDH transcript levels were assessed by conventional and real-time RT-PCR on mucosal RNA as in Figs. 7 and 8. Anti-GR-1-treated mice failed to clear the infection and to launch a strong IFN-γ response. The p values were calculated by the Mann-Whitney U test. A gray asterisk indicates values below the detection limit. B, Representative sections are shown of TCR-β−/− mice that have been infected only (inf.) or have received CD4+CD25− T cells, but no Ab treatment (inf. + CD4+) or both the cells and the Ab treatment (inf. + CD4++ anti-GR-1). A section from the mouse in which the treatment failed is shown as well (marked by a red asterisk). C, Histopathology scores for all mice of the study. Group sizes were five mice each. The p values are calculated by Student’s t test, excluding the mouse in which the treatment failed. Thin bars in C indicate the means. In this study, we demonstrate a crucial role of IFN-γ for the control of Helicobacter infection and for induction of preneoplastic changes of the infected gastric mucosa. This dual role is evident in an experimental murine host that is capable of reducing the bacterial burden upon the onset of an adaptive immune response (but not capable of complete spontaneous clearance) and that therefore is also susceptible to ensuing immunopathology. We show that the extent of the IFN-γ response differs among genetically virtually identical animals (littermates) and that it is not only predictive of Helicobacter control and resulting gastric pathology, but is also causally associated with both. In addition to contributing to the spontaneous reduction in bacterial burden in experimentally infected mice, a strong IFN-γ response additionally is characteristic of and required for protection induced by an H. pylori vaccine. Our data confirm and extend several early studies that have proposed a role for TH1 cells (43, 44), and IFN-γ in particular, in the control of H. pylori infection upon vaccination (45) or primary infection (46). Several previous studies also noted reduced gastritis in infected IFN-γ−/− compared with wild-type mice (38, 44, 45), but did not assess preneoplastic epithelial pathology because it does not readily form after infection with H. pylori (as opposed to the more virulent H. felis). In conflict with our data and those of Akhiani et al. (45), two previous studies have not found a conclusive role for IFN-γ in vaccine-induced protection (38, 47), despite elucidating the contribution of IL-12, another TH1 signature cytokine, to H. pylori clearance (47). Experimental differences between the four studies that have assessed the role of IFN-γ in protection so far include the challenge strain used, the time-to-sacrifice after challenge, the overall level of protection achieved by vaccination, and, perhaps most importantly, the gender of the vaccinated mice. We have observed clear differences in vaccine-induced protection in female and male wild-type mice (females are typically significantly better protected), as well as in spontaneous clearance models (i.e., IL-10−/− mice; A. Sayi and A. Müller, unpublished observation). Although the significance of this gender difference remains unclear, we suspect that it might provide an explanation for the conflicting results of the four studies. We should also stress that, although the differences in protection between wild-type and IFN-γ−/− animals are clearly significant in our hands (p = 0.0014), the defect in clearance of the IFN-γ−/− strain is much less pronounced than the defect of MHCII−/− or CD4−/− strains lacking CD4+ T cells entirely (which are colonized as well as unvaccinated controls; I. Hitzler and A. Müller, unpublished data). In the vaccine model, the successful control of Helicobacter colonization upon immunization is accompanied by considerable gastritis and mild atrophy at the antrum/corpus junction (Fig. 6⇑). This so-called “postimmunization” gastritis is of concern in Helicobacter vaccine development (41), as none of the published vaccination approaches achieves sterile immunity. Indeed, we did not observe a regression of vaccine-induced pathology even 7 wk after challenge (i.e., 5 wk after a significant reduction in bacterial loads; Fig. 6⇑), confirming published observations (41). We have shown previously in a long-term vaccine study that H. felis-induced MALT lymphoma formation in BALB/c mice is prevented by vaccination (48). Similarly, Sutton et al. (41) have demonstrated that at least the mild pathology triggered by H. pylori SS1 infection in C57BL/6 mice is not exacerbated upon vaccination in the long run. Nevertheless, the issue of whether vaccination and challenge with more immunogenic strains (better mimicking the human-pathogen interaction) will induce unacceptable preneoplastic pathology in susceptible (e.g., C57BL/6) hosts because the bacteria are reduced but not eliminated remains unsolved and certainly requires future attention if Helicobacter vaccination is to become a reality. In any case, our data argue that the distinction between “pathogenic T cells” and “protective T cells” may not be correct and that the protective (vaccine-induced) vs natural responses to the infection are quantitatively rather than qualitatively different (as discussed in Ref. 49). Multiple cell types are capable of producing IFN-γ during both the innate and adaptive phases of the immune response. By depletion of NK and NKT cells from experimentally infected mice, we have ruled out a crucial contribution of these two cell types in the control of Helicobacter infection. Rather, we observed that CD4+CD25− effector T cells produce large amounts of IFN-γ when adoptively transferred into immunodeficient recipients (Rag-1−/− or TCR-β−/−). In these adoptive transfer models, the recipients clear or reduce the infection and develop severe premalignant pathology, as was also documented recently by Lee et al. (50); IFN-γ is essential for both effects since cells from an IFN-γ−/− background fail to eliminate the infection and are less potent than wild-type cells in initiating gastric pathology (Fig. 8⇑). IFN-γ production and CD4+CD25− effector cell-mediated pathology (as well as clearance) depend on Helicobacter infection on the part of the donor and on the part of the recipient (Fig. 7⇑). In addition to NK-, NKT- and TH1-polarized CD4+ cells, CD8+ T cells are known to be important producers of IFN-γ during the adaptive phase of an immune response and have been implicated previously in Helicobacter-induced gastritis (51). We thus tested their possible contribution to Helicobacter clearance and associated immunopathology in our adoptive transfer model. However, we found no evidence for gastric IFN-γ production, or for a reduction of bacterial burden, or for gastric pathology in CD8+ T cell recipients, thereby ruling out an important effector function of CD8+ T cells at least in this model. IFN-γ is best known for its effects on macrophages and dendritic cells (DC), which are induced to present Ag in the context of MHC class II upon exposure (39). Depletion of macrophages with liposome-encapsulated chlodronate (a bisphosphonate toxin; data not shown) did not reduce vaccine efficacy, suggesting that macrophages are dispensable for the effector phase of Helicobacter clearance. The presence of IFN-γ during the TLR-dependent activation of DC has been shown to promote the production of IL-12, a cytokine which drives further TH1 differentiation and amplifies the production of IFN-γ, thereby creating a positive feedback loop. According to two recent reports, DC residing in Peyer’s patches of the small intestine prime a Helicobacter-specific TH1-polarized immune response upon exposure to the coccoid form of H. pylori and direct migration of effector T cells to the gastric mucosa (52, 53). However, the role of DC in Helicobacter clearance upon vaccination remains poorly understood, mostly due to the lack of appropriate tools. Interestingly, multiple lineages of gastric epithelial cells respond to IFN-γ exposure. Kang et al. (54) found that the human gastric cell line NCI-N87 acquired mucous neck cell traits upon treatment with IFN-γ such as secretion of mucus and expression of the mucin MUC6, TFF2, and pepsinogen II. Infusion of IFN-γ into wild-type mice was further shown to induce expansion of the mucous neck cell compartment in vivo, probably by triggering the deregulated proliferation of this cell type (54). In a study investigating a rare progenitor cell type of the antral gland by lineage tracing, Qiao et al. (55) observed that these cells have multilineage potential (i.e., they give rise to all lineages of the antral gland) and that they multiply in response to IFN-γ. In our own previous study investigating the response of the three terminally differentiated gastric epithelial lineages to Helicobacter infection in vivo using a laser capture approach, we found that the mucus-producing pit cell responds strongly to infection (56) by up-regulating numerous known target genes of the IFN-γ signaling pathway. We extended these findings in the current study by treating an immortalized gastric murine epithelial cell line with IFN-γ. Virtually all of the most strongly IFN-γ-induced genes in this line were coregulated with IFN-γ in preneoplastic gastric lesions, suggesting their induction by IFN-γ also in vivo. It is interesting to note in this context that predominantly hyperplastic, but not metaplastic, mucosa was characterized by high IFN-γ production (Fig. 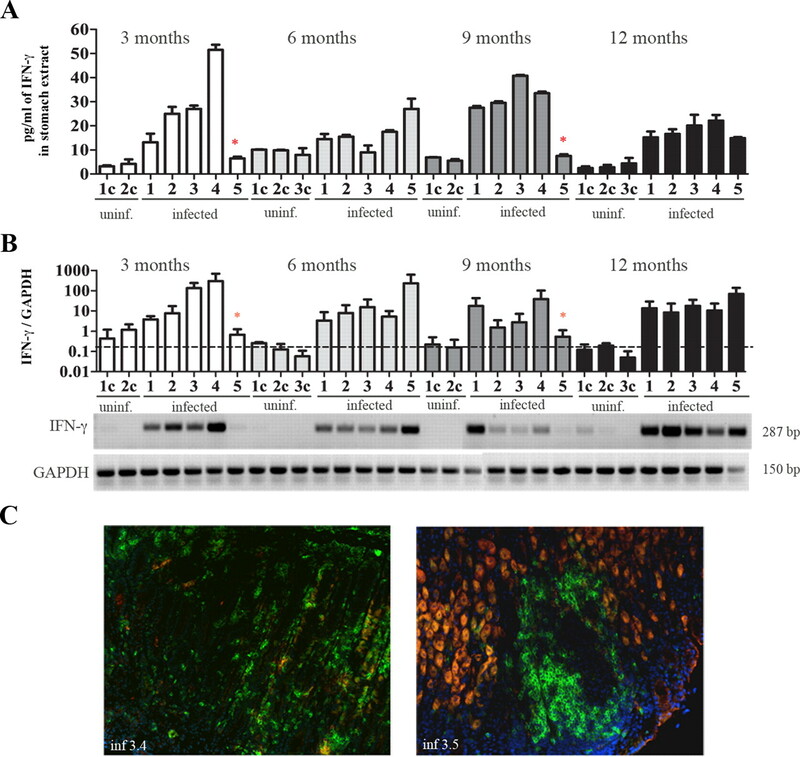 4⇑); this finding possibly suggests that only the former cell type expands as a result of IFN-γ exposure, whereas metaplasia may arise by an alternative mechanism. Additional evidence also points in this direction: metaplasia was the only one of the four histopathological parameters evaluated that did not show a significant association with IFN-γ expression in a large group of wild-type mice with various degrees of pathology (Fig. 3⇑D). It was also the only lesion that appeared in immunodeficient recipients of IFN-γ−/− CD4+ effector cells (Fig. 8⇑C). Concluding these findings, it is tempting to speculate that IFN-γ produced in the setting of chronic inflammation in the stomach acts directly on one or more epithelial lineages to induce their deregulated proliferation and transformation to premalignant, hyperplastic phenotypes. Whether epithelial cells are also involved in clearance of the bacteria is currently unknown. Indeed, the downstream effector mechanisms leading to elimination of the bacteria from the infected stomach are not well understood, neither in spontaneous nor vaccine-induced clearance models. Whereas Abs seem to be dispensable (57), neutrophil granulocytes (58, 59) and mast cells (60) have been implied in Helicobacter clearance. Neutrophils in particular were found to be important in a spontaneous clearance model of H. felis infection in IL-10−/− mice (58), in a vaccine-induced clearance model (59), and in our CD4+ T cell-mediated clearance model in immunodeficient mice (Fig. 9⇑), suggesting a common downstream effector mechanism involving this cell type. The CXC chemokine IL-8 (CXCL-8) and its functional murine counterpart MIP-2 are well known to induce neutrophil attraction, activation, and transendothelial migration. IL-8 is strongly induced in human gastric cancer cells such as the commonly used AGS cell line upon coculture with H. pylori (61, 62, 63), and this signal is generally assumed to initiate the acute (neutrophil-dominated) inflammation in the early stages of Helicobacter infection. Similarly, we observed that H. pylori infection triggers the production of MIP-2 in primary as well as immortalized murine gastric cells in vitro (I. Arnold and A. Müller, unpublished data). In vivo, IL-8 has been shown to be strongly induced in the infected gastric human mucosa and its levels are correlated positively with pathology (64). In accordance with these findings, we measured high levels of MIP-2 transcript in infected mice and we detected the presence of neutrophils in the gastric mucosa histologically and by ELISA (data not shown for wild-type mice). Neutrophils are sometimes found luminally and in close proximity to Helicobacter organisms (data not shown). Interestingly however, we observed only minor MIP-2 induction (Figs. 7–9⇑⇑⇑) and neutrophil infiltration in mice lacking either T cells or T and B cells. Adoptive transfer of CD4+ effector populations restores MIP-2 signals (Figs. 7–9⇑⇑⇑) and neutrophil infiltration (Fig. 8⇑) in these strains. Whether MIP-2 is produced by the T effector cells themselves in this scenario or its increased production by epithelial cells is triggered by lymphocyte-derived signals is currently not known. Either way, efficient gastric MIP-2 production and neutrophil recruitment depends on CD4+ T cell infiltration in conjunction with infection (Fig. 7⇑), but is independent of concomitant IFN-γ production (Fig. 8⇑). In conclusion, our data are consistent with the following scenario: the initial contact of bacteria with gastric epithelial cells triggers moderate production of MIP-2. This instigates the modest infiltration and activation of neutrophils, which is itself a prerequisite for the subsequent recruitment of Helicobacter-specific T cells to the site of infection. These cells then generate the strong MIP-2 signals that are required to attract more neutrophils, which in turn accomplish clearance or reduction of the infection. IFN-γ secretion by CD4+ TH1 cells is crucial for clearance. Although being dispensable for the recruitment of neutrophils in our as well as other model systems (65), IFN-γ is known to induce neutrophil phagocytosis (66), microbicidal activity (67), and survival (68). We propose that CD4+ T cell-derived IFN-γ must act locally on neutrophils to activate their anti-Helicobacter properties. 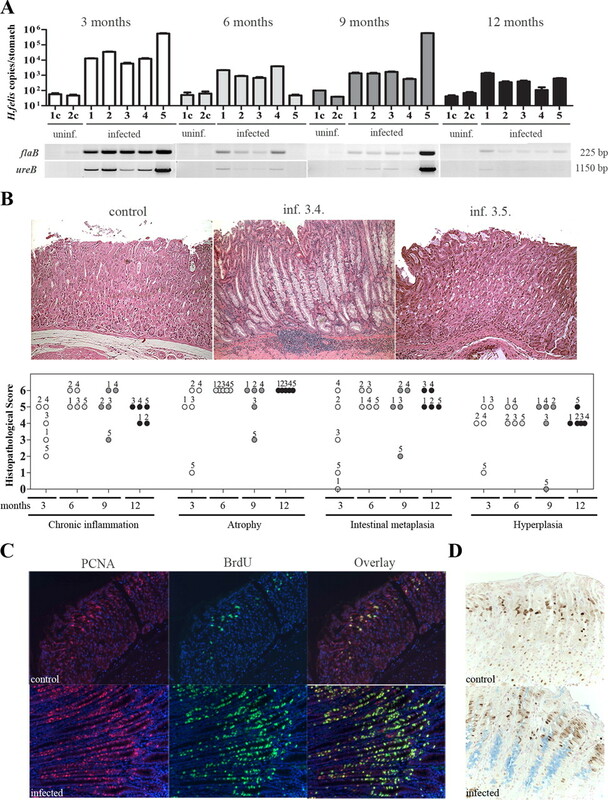 In addition (or alternatively) to IFN-γ, another proinflammatory cytokine, IL-17, has recently been assigned an important function in the mucosal response to Helicobacter infection, in particular in neutrophil recruitment. IL-17 levels are increased in the human-infected mucosa (69) as well as in vaccinated mice (59), and this seems to initiate acute inflammation in the mouse model (70). However, a conclusive functional role for IL-17 in Helicobacter control has not yet been found; on the contrary, IL-17−/− mice seem to be less colonized than wild-type mice (70). Data on vaccine studies in IL-17−/− mice are not yet available, but will hopefully clarify soon whether IL-17 is important in vaccine-induced protection. Being the signature cytokine of TH1-biased Th responses, IFN-γ is efficiently down-regulated by TH2 cytokines such as IL-4. Indeed, the BALB/c strain of mice that is known to predominantly mount TH2-biased responses to infectious agents is completely protected from developing the preneoplastic lesions typically observed in the C57BL/6 background. Experimental polarization of systemic responses to Helicobacter by concurrent helminth infection was further shown to alleviate gastric premalignant pathology (71), lending considerable support to this model. In fact, an epidemiological study from Colombia looking at TH2-polarized responses to Helicobacter and concurrent helminth infections in children suggested that populations with low gastric cancer risk had significantly higher rates of helminths than high-risk populations (72). Apart from environmental factors affecting TH1/TH2 balance, disease outcome upon chronic infection may be influenced by polymorphisms affecting IFN-γ signaling, for instance in the IFN-γ receptor chain 1 (IFNGR) or the IFNG gene itself (25, 73, 74, 75). Overall, both animal experimental and epidemiological evidence seems to increasingly imply the (T cell-driven) immune response to the infection as a driving force behind gastric preneoplasia. Our finding that Rag-1−/− and TCR-β−/− are completely protected from premalignant pathology is in line with this assumption. Although there is obviously a clear contribution of Helicobacter virulence factors (such as the type IV secretion substrate CagA) to gastric cancer risk (76), one may speculate that such factors act as immune modulators (e.g., by disrupting the epithelial barrier and thereby exacerbating inflammation (77)) rather than as true bacterial oncoproteins. Finally, additional, as yet unknown, factors seem to affect the type of immune response launched against the infection, as illustrated by the heterogeneity of responses observed in mice of the same gender and same age, infected for the same time with the same strain (Figs. 1⇑ and 3⇑). Although superinfections with other bacteria could be a contributing factor (although this may not be very likely for mice inhabiting the same cage for many months), we favor an explanation factoring in the “stress” component. We speculate that in groups of mice housed together (especially males, which were used mostly in our studies), the highest ranking male(s) might be the least stressed and, as a result, is least susceptible to Helicobacter-induced gastritis and pathology. In conclusion, our results confirm and extend experimental and epidemiological data suggesting that IFN-γ plays an important role in the control of Helicobacter infection. At the same time, CD4+ T cell-derived IFN-γ provides the key stimulus for development of gastric premalignant lesions that can progress to gastric cancer. We thank Isabella Toller for help with the myeloperoxidase assay and comments on this manuscript, and Joe Jiricny and all members of the Institute for helpful discussions. We are grateful to the Functional Genomics Center Zurich for access to equipment and to Andrea Patrignani for assistance with microarray experiments. Trevor Lawley, Amita Kawale, and Pauline Chu are thanked for help with animal experimentation and histology. A.M. wishes to thank Stanley Falkow for continued support and helpful discussions. ↵1 This study was funded by grants from Schweizer Nationalfonds (3100A0-113452), the UBS Foundation (BA29 S8Q7-DZZ 969/A), and the Nils and Desiree Yde Stiftung to A.M. Additional funding was supplied by the University Research Priority Program in Systems Biology/Functional Genomics and the Institute of Molecular Cancer Research. ↵2 A.S., E.K., and I.H. contributed equally to this work. ↵4 Abbreviations used in this paper: PCNA, proliferating cell nuclear Ag; IP-10, IFN-γ-inducible protein 10. Parsonnet, J., G. D. Friedman, D. P. Vandersteen, Y. Chang, J. H. Vogelman, N. Orentreich, R. K. Sibley. 1991. Helicobacter pylori infection and the risk of gastric carcinoma. N. Engl. J. Med. 325: 1127-1131. Parsonnet, J., S. Hansen, L. Rodriguez, A. B. Gelb, R. A. Warnke, E. Jellum, N. Orentreich, J. H. Vogelman, G. D. Friedman. 1994. Helicobacter pylori infection and gastric lymphoma. N. Engl. J. Med. 330: 1267-1271. Parsonnet, J., P. G. Isaacson. 2004. Bacterial infection and MALT lymphoma. N. Engl. J. Med. 350: 213-215. Danesh, J.. 1999. Helicobacter pylori infection and gastric cancer: systematic review of the epidemiological studies. Aliment Pharmacol. Ther. 13: 851-856. Marshall, B. J., J. R. Warren. 1984. Unidentified curved bacilli in the stomach of patients with gastritis and peptic ulceration. Lancet 1: 1311-1315. Pritchard, D. M., J. E. Crabtree. 2006. Helicobacter pylori and gastric cancer. Curr. Opin. Gastroenterol. 22: 620-625. Parkin, D. M., P. Pisani, J. Ferlay. 1999. Estimates of the worldwide incidence of 25 major cancers in 1990. Int. J. Cancer 80: 827-841. Murray, C. J., A. D. Lopez. 1997. Alternative projections of mortality and disability by cause 1990–2020: Global Burden of Disease Study. Lancet 349: 1498-1504. Lauren, P.. 1965. The two histological main types of gastric carcinoma: diffuse and so-called intestinal-type carcinoma: an attempt at a histo-clinical classification. Acta Pathol. Microbiol. Scand. 64: 31-49. Grabiec, J., D. A. Owen. 1985. Carcinoma of the stomach in young persons. Cancer 56: 388-396. Chen, X., S. Y. Leung, S. T. Yuen, K. M. Chu, J. Ji, R. Li, A. S. Chan, S. Law, O. G. Troyanskaya, J. Wong, S. So, D. Botstein, P. O. Brown. 2003. Variation in gene expression patterns in human gastric cancers. Mol. Biol. Cell 14: 3208-3215. Correa, P.. 1988. A human model of gastric carcinogenesis. Cancer Res. 48: 3554-3560. Correa, P.. 1995. Helicobacter pylori and gastric carcinogenesis. Am. J. Surg. Pathol. 19: (Suppl. 1):S37-S43. Correa, P., W. Haenszel, C. Cuello, S. Tannenbaum, M. Archer. 1975. A model for gastric cancer epidemiology. Lancet 2: 58-60. Baldwin, D. N., B. Shepherd, P. Kraemer, M. K. Hall, L. K. Sycuro, D. M. Pinto-Santini, N. R. Salama. 2007. Identification of Helicobacter pylori genes that contribute to stomach colonization. Infect. Immun. 75: 1005-1016. Sakagami, T., M. Dixon, J. O'Rourke, R. Howlett, F. Alderuccio, J. Vella, T. Shimoyama, A. Lee. 1996. Atrophic gastric changes in both Helicobacter felis and Helicobacter pylori infected mice are host dependent and separate from antral gastritis. Gut 39: 639-648. Fox, J. G., B. J. Sheppard, C. A. Dangler, M. T. Whary, M. Ihrig, T. C. Wang. 2002. Germ-line p53-targeted disruption inhibits Helicobacter-induced premalignant lesions and invasive gastric carcinoma through down-regulation of Th1 proinflammatory responses. Cancer Res. 62: 696-702. Enno, A., J. L. O'Rourke, C. R. Howlett, A. Jack, M. F. Dixon, A. Lee. 1995. MALToma-like lesions in the murine gastric mucosa after long-term infection with Helicobacter felis: a mouse model of Helicobacter pylori-induced gastric lymphoma. Am. J. Pathol. 147: 217-222. Enno, A., J. O'Rourke, S. Braye, R. Howlett, A. Lee. 1998. Antigen-dependent progression of mucosa-associated lymphoid tissue (MALT)-type lymphoma in the stomach: effects of antimicrobial therapy on gastric MALT lymphoma in mice. Am. J. Pathol. 152: 1625-1632. Mueller, A., J. O'Rourke, J. Grimm, K. Guillemin, M. F. Dixon, A. Lee, S. Falkow. 2003. Distinct gene expression profiles characterize the histopathological stages of disease in Helicobacter-induced mucosa-associated lymphoid tissue lymphoma. Proc. Natl. Acad. Sci. USA 100: 1292-1297. Mueller, A., J. O'Rourke, P. Chu, A. Chu, M. F. Dixon, D. M. Bouley, A. Lee, S. Falkow. 2005. The role of antigenic drive and tumor-infiltrating accessory cells in the pathogenesis of Helicobacter-induced mucosa-associated lymphoid tissue lymphoma. Am. J. Pathol. 167: 797-812. Fox, J. G., A. B. Rogers, M. Ihrig, N. S. Taylor, M. T. Whary, G. Dockray, A. Varro, T. C. Wang. 2003. Helicobacter pylori-associated gastric cancer in INS-GAS mice is gender specific. Cancer Res. 63: 942-950. Fox, J. G., T. C. Wang, A. B. Rogers, T. Poutahidis, Z. Ge, N. Taylor, C. A. Dangler, D. A. Israel, U. Krishna, K. Gaus, R. M. Peek, Jr. 2003. Host and microbial constituents influence Helicobacter pylori-induced cancer in a murine model of hypergastrinemia. Gastroenterology 124: 1879-1890. Vilaichone, R. K., V. Mahachai, S. Tumwasorn, J. Y. Wu, D. Y. Graham, Y. Yamaoka. 2005. Gastric mucosal cytokine levels in relation to host interleukin-1 polymorphisms and Helicobacter pylori cagA genotype. Scand. J. Gastroenterol. 40: 530-539. Rad, R., A. Dossumbekova, B. Neu, R. Lang, S. Bauer, D. Saur, M. Gerhard, C. Prinz. 2004. Cytokine gene polymorphisms influence mucosal cytokine expression, gastric inflammation, and host specific colonisation during Helicobacter pylori infection. Gut 53: 1082-1089. Sakai, K., M. Kita, N. Sawai, S. Shiomi, Y. Sumida, K. Kanemasa, S. Mitsufuji, J. Imanishi, Y. Yamaoka. 2008. Levels of interleukin-18 are markedly increased in Helicobacter pylori-infected gastric mucosa among patients with specific IL18 genotypes. J. Infect. Dis. 197: 1752-1761. Bontems, P., F. Robert, A. Van Gossum, S. Cadranel, F. Mascart. 2003. Helicobacter pylori modulation of gastric and duodenal mucosal T cell cytokine secretions in children compared with adults. Helicobacter 8: 216-226. El-Omar, E. M., M. Carrington, W. H. Chow, K. E. McColl, J. H. Bream, H. A. Young, J. Herrera, J. Lissowska, C. C. Yuan, N. Rothman, et al 2000. Interleukin-1 polymorphisms associated with increased risk of gastric cancer. Nature 404: 398-402. El-Omar, E. M., C. S. Rabkin, M. D. Gammon, T. L. Vaughan, H. A. Risch, J. B. Schoenberg, J. L. Stanford, S. T. Mayne, J. Goedert, W. J. Blot, et al 2003. Increased risk of noncardia gastric cancer associated with proinflammatory cytokine gene polymorphisms. Gastroenterology 124: 1193-1201. Lee, A., J. O'Rourke, M. C. De Ungria, B. Robertson, G. Daskalopoulos, M. F. Dixon. 1997. A standardized mouse model of Helicobacter pylori infection: introducing the Sydney strain. Gastroenterology 112: 1386-1397. Fujikawa, A., D. Shirasaka, S. Yamamoto, H. Ota, K. Yahiro, M. Fukada, T. Shintani, A. Wada, N. Aoyama, T. Hirayama, et al 2003. Mice deficient in protein tyrosine phosphatase receptor type Z are resistant to gastric ulcer induction by VacA of Helicobacter pylori. Nat. Genet. 33: 375-381. Tucker, M. S., E. M. Eves, B. H. Wainer, M. R. Rosner. 1993. Activation of mitogen-activated protein kinase by epidermal growth factor in hippocampal neurons and neuronal cell lines. J. Neurochem. 61: 1376-1387. Stoicov, C., M. Whary, A. B. Rogers, F. S. Lee, K. Klucevsek, H. Li, X. Cai, R. Saffari, Z. Ge, I. A. Khan, et al 2004. Coinfection modulates inflammatory responses and clinical outcome of Helicobacter felis and Toxoplasma gondii infections. J. Immunol. 173: 3329-3336. Dixon, M. F., R. M. Genta, J. H. Yardley, P. Correa. 1996. Classification and grading of gastritis: The updated Sydney System. International Workshop on the Histopathology of Gastritis, Houston 1994. Am. J. Surg. Pathol. 20: 1161-1181. Chen, X. Y., R. W. van der Hulst, M. J. Bruno, A. van der Ende, S. D. Xiao, G. N. Tytgat, F. J. Ten Kate. 1999. Interobserver variation in the histopathological scoring of Helicobacter pylori related gastritis. J. Clin. Pathol. 52: 612-615. Mota, R. A., F. Sanchez-Bueno, L. Saenz, D. Hernandez-Espinosa, J. Jimeno, P. L. Tornel, A. Martinez-Torrano, P. Ramirez, P. Parrilla, J. Yelamos. 2005. Inhibition of poly(ADP-ribose) polymerase attenuates the severity of acute pancreatitis and associated lung injury. Lab. Invest. 85: 1250-1262. Torsten Hothorn, K. H., A. van de Wiel Mark, Achim Zeileis. 2006. A Lego system for conditional inference. Am. Statistician 60: 257-263. Sawai, N., M. Kita, T. Kodama, T. Tanahashi, Y. Yamaoka, Y. Tagawa, Y. Iwakura, J. Imanishi. 1999. Role of γ interferon in Helicobacter pylori-induced gastric inflammatory responses in a mouse model. Infect. Immun. 67: 279-285. Zeisberger, S. M., B. Odermatt, C. Marty, A. H. Zehnder-Fjallman, K. Ballmer-Hofer, R. A. Schwendener. 2006. Clodronate-liposome-mediated depletion of tumour-associated macrophages: a new and highly effective antiangiogenic therapy approach. Br. J. Cancer 95: 272-281. Sutton, P., S. J. Danon, M. Walker, L. J. Thompson, J. Wilson, T. Kosaka, A. Lee. 2001. Post-immunisation gastritis and Helicobacter infection in the mouse: a long term study. Gut 49: 467-473. Sporri, R., N. Joller, U. Albers, H. Hilbi, A. Oxenius. 2006. MyD88-dependent IFN-γ production by NK cells is key for control of Legionella pneumophila infection. J. Immunol. 176: 6162-6171. Mohammadi, M., S. Czinn, R. Redline, J. Nedrud. 1996. 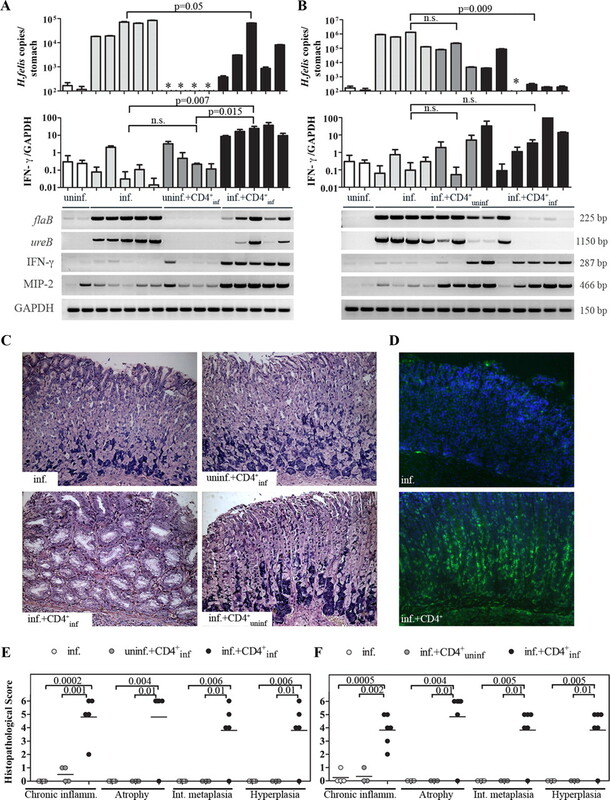 Helicobacter-specific cell-mediated immune responses display a predominant Th1 phenotype and promote a delayed-type hypersensitivity response in the stomachs of mice. J. Immunol. 156: 4729-4738. Smythies, L. E., K. B. Waites, J. R. Lindsey, P. R. Harris, P. Ghiara, P. D. Smith. 2000. 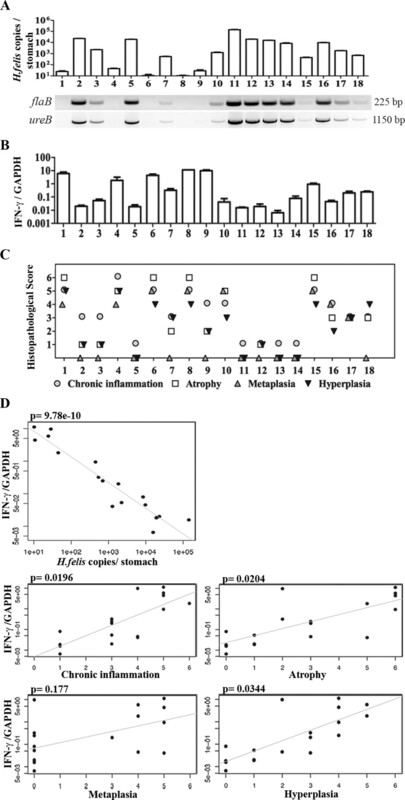 Helicobacter pylori-induced mucosal inflammation is Th1 mediated and exacerbated in IL-4, but not IFN-γ, gene-deficient mice. J. Immunol. 165: 1022-1029. Akhiani, A. A., J. Pappo, Z. Kabok, K. Schon, W. Gao, L. E. Franzen, N. Lycke. 2002. Protection against Helicobacter pylori infection following immunization is IL-12-dependent and mediated by Th1 cells. J. Immunol. 169: 6977-6984. Kamradt, A. E., M. Greiner, P. Ghiara, S. H. Kaufmann. 2000. Helicobacter pylori infection in wild-type and cytokine-deficient C57BL/6 and BALB/c mouse mutants. Microbes Infect. 2: 593-597. Garhart, C. A., F. P. Heinzel, S. J. Czinn, J. G. Nedrud. 2003. 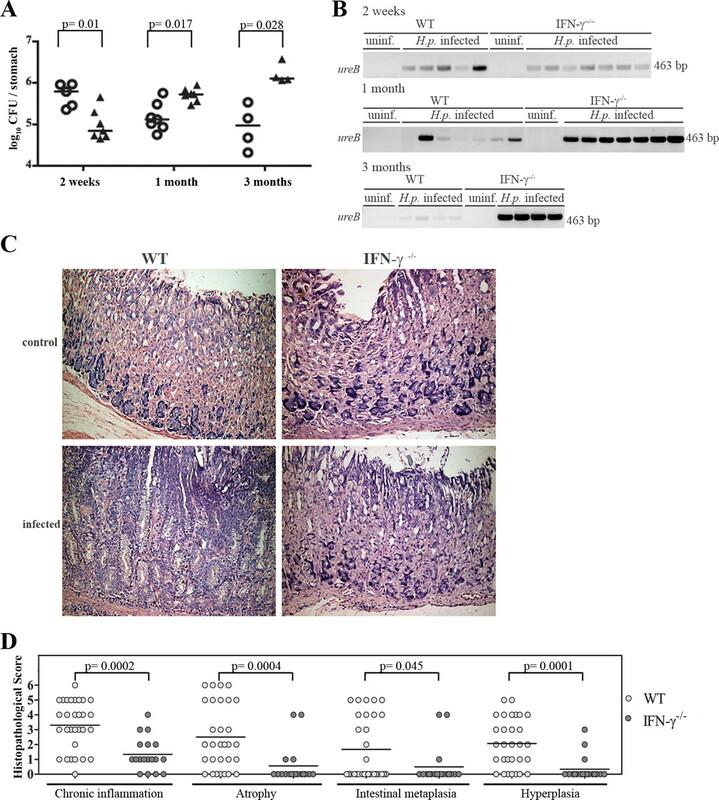 Vaccine-induced reduction of Helicobacter pylori colonization in mice is interleukin-12 dependent but γ interferon and inducible nitric oxide synthase independent. Infect. Immun. 71: 910-921. Mueller, A., J. O'Rourke, P. Chu, C. C. Kim, P. Sutton, A. Lee, S. Falkow. 2003. Protective immunity against Helicobacter is characterized by a unique transcriptional signature. Proc. Natl. Acad. Sci. USA 100: 12289-12294. Blanchard, T. G., J. C. Eisenberg, Y. Matsumoto. 2004. Clearance of Helicobacter pylori infection through immunization: the site of T cell activation contributes to vaccine efficacy. Vaccine 22: 888-897. Lee, C. W., V. P. Rao, A. B. Rogers, Z. Ge, S. E. Erdman, M. T. Whary, J. G. Fox. 2007. Wild-type and interleukin-10-deficient regulatory T cells reduce effector T-cell-mediated gastroduodenitis in Rag2−/− mice, but only wild-type regulatory T cells suppress Helicobacter pylori gastritis. Infect. Immun. 75: 2699-2707. Tan, M. P., J. Pedersen, Y. Zhan, A. M. Lew, M. J. Pearse, O. L. Wijburg, R. A. Strugnell. 2008. CD8+ T cells are associated with severe gastritis in Helicobacter pylori-infected mice in the absence of CD4+ T cells. Infect. Immun. 76: 1289-1297. Kiriya, K., N. Watanabe, A. Nishio, K. Okazaki, M. Kido, K. Saga, J. Tanaka, T. Akamatsu, S. Ohashi, M. Asada, et al 2007. Essential role of Peyer’s patches in the development of Helicobacter-induced gastritis. Int. Immunol. 19: 435-446. Nagai, S., H. Mimuro, T. Yamada, Y. Baba, K. Moro, T. Nochi, H. Kiyono, T. Suzuki, C. Sasakawa, S. Koyasu. 2007. Role of Peyer’s patches in the induction of Helicobacter pylori-induced gastritis. Proc. Natl. Acad. Sci. USA 104: 8971-8976. Kang, W., S. Rathinavelu, L. C. Samuelson, J. L. Merchant. 2005. Interferon γ induction of gastric mucous neck cell hypertrophy. Lab. Invest. 85: 702-715. Qiao, X. T., J. W. Ziel, W. McKimpson, B. B. Madison, A. Todisco, J. L. Merchant, L. C. Samuelson, D. L. Gumucio. 2007. Prospective identification of a multilineage progenitor in murine stomach epithelium. Gastroenterology 133: 1989-1998. Mueller, A., D. S. Merrell, J. Grimm, S. Falkow. 2004. Profiling of microdissected gastric epithelial cells reveals a cell type-specific response to Helicobacter pylori infection. Gastroenterology 127: 1446-1462. Ermak, T. H., P. J. Giannasca, R. Nichols, G. A. Myers, J. Nedrud, R. Weltzin, C. K. Lee, H. Kleanthous, T. P. Monath. 1998. Immunization of mice with urease vaccine affords protection against Helicobacter pylori infection in the absence of antibodies and is mediated by MHC class II-restricted responses. J. Exp. Med. 188: 2277-2288. Ismail, H. F., P. Fick, J. Zhang, R. G. Lynch, D. J. Berg. 2003. Depletion of neutrophils in IL-10−/− mice delays clearance of gastric Helicobacter infection and decreases the Th1 immune response to Helicobacter. J. Immunol. 170: 3782-3789. DeLyria, E. S., R. W. Redline, T. G. Blanchard. 2009. Vaccination of mice against H. pylori induces a strong Th-17 response and immunity that is neutrophil dependent. Gastroenterology 136: 247-256. Velin, D., D. Bachmann, H. Bouzourene, P. Michetti. 2005. Mast cells are critical mediators of vaccine-induced Helicobacter clearance in the mouse model. Gastroenterology 129: 142-155. Selbach, M., S. Moese, T. F. Meyer, S. Backert. 2002. Functional analysis of the Helicobacter pylori cag pathogenicity island reveals both VirD4-CagA-dependent and VirD4-CagA-independent mechanisms. Infect. Immun. 70: 665-671. Segal, E. D., C. Lange, A. Covacci, L. S. Tompkins, S. Falkow. 1997. Induction of host signal transduction pathways by Helicobacter pylori. Proc. Natl. Acad. Sci. USA 94: 7595-7599. Fischer, W., J. Puls, R. Buhrdorf, B. Gebert, S. Odenbreit, R. Haas. 2001. Systematic mutagenesis of the Helicobacter pylori cag pathogenicity island: essential genes for CagA translocation in host cells and induction of interleukin-8. Mol. Microbiol. 42: 1337-1348. Xuan, J., R. Deguchi, H. Yanagi, H. Ozawa, T. Urano, Y. Ogawa, R. Fukuda, S. Kojima, M. Nishina, H. Sudo, et al 2005. Relationship between gastric mucosal IL-8 levels and histological gastritis in patients with Helicobacter pylori infection. Tokai J. Exp. Clin. Med. 30: 83-88. Pearl-Yafe, M., I. Fabian, D. Halperin, E. Flatau, S. Werber, I. Shalit. 2007. Interferon-γ and bacterial lipopolysaccharide act synergistically on human neutrophils enhancing interleukin-8, interleukin-1β, tumor necrosis factor-α, and interleukin-12 p70 secretion and phagocytosis via upregulation of Toll-like receptor 4. Shock 27: 226-231. Rodrigues, D. R., L. A. Dias-Melicio, S. A. Calvi, M. T. Peracoli, A. M. Soares. 2007. Paracoccidioides brasiliensis killing by IFN-γ, TNF-α and GM-CSF activated human neutrophils: role for oxygen metabolites. Med. Mycol. 45: 27-33. Yoshimura, T., M. Takahashi. 2007. IFN-γ-mediated survival enables human neutrophils to produce MCP-1/CCL2 in response to activation by TLR ligands. J. Immunol. 179: 1942-1949. Caruso, R., D. Fina, O. A. Paoluzi, G. Del Vecchio Blanco, C. Stolfi, A. Rizzo, F. Caprioli, M. Sarra, F. Andrei, M. C. Fantini, et al 2008. IL-23-mediated regulation of IL-17 production in Helicobacter pylori-infected gastric mucosa. Eur. J. Immunol. 38: 470-478. Shiomi, S., A. Toriie, S. Imamura, H. Konishi, S. Mitsufuji, Y. Iwakura, Y. Yamaoka, H. Ota, T. Yamamoto, J. Imanishi, M. Kita. 2008. IL-17 is involved in Helicobacter pylori-induced gastric inflammatory responses in a mouse model. Helicobacter 13: 518-524. Fox, J. G., P. Beck, C. A. Dangler, M. T. Whary, T. C. Wang, H. N. Shi, C. Nagler-Anderson. 2000. Concurrent enteric helminth infection modulates inflammation and gastric immune responses and reduces Helicobacter-induced gastric atrophy. Nat. Med. 6: 536-542. Whary, M. T., N. Sundina, L. E. Bravo, P. Correa, F. Quinones, F. Caro, J. G. Fox. 2005. Intestinal helminthiasis in Colombian children promotes a Th2 response to Helicobacter pylori: possible implications for gastric carcinogenesis. Cancer Epidemiol. Biomarkers Prev. 14: 1464-1469. Thye, T., G. D. Burchard, M. Nilius, B. Muller-Myhsok, R. D. Horstmann. 2003. Genomewide linkage analysis identifies polymorphism in the human interferon-gamma receptor affecting Helicobacter pylori infection. Am. J. Hum. Genet. 72: 448-453. Zambon, C. F., D. Basso, F. Navaglia, C. Belluco, A. Falda, P. Fogar, E. Greco, N. Gallo, M. Rugge, F. Di Mario, M. Plebani. 2005. 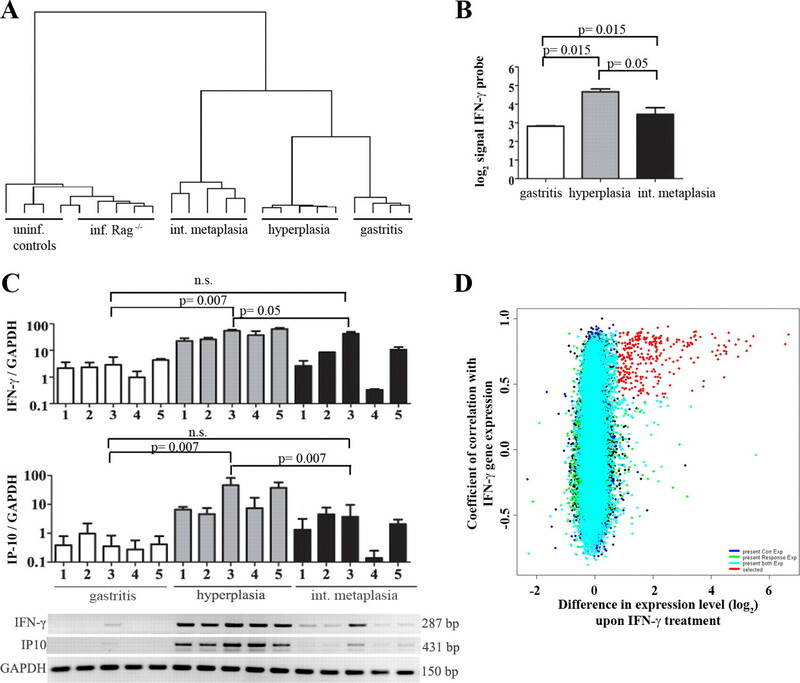 Pro- and anti-inflammatory cytokines gene polymorphisms and Helicobacter pylori infection: interactions influence outcome. Cytokine 29: 141-152. Canedo, P., G. Corso, F. Pereira, N. Lunet, G. Suriano, C. Figueiredo, C. Pedrazzani, H. Moreira, H. Barros, F. Carneiro, et al 2008. The interferon γ receptor 1 (IFNGR1)-56C/T gene polymorphism is associated with increased risk of early gastric carcinoma. Gut 57: 1504-1508. Huang, J. Q., G. F. Zheng, K. Sumanac, E. J. Irvine, R. H. Hunt. 2003. Meta-analysis of the relationship between cagA seropositivity and gastric cancer. Gastroenterology 125: 1636-1644. Amieva, M. R., R. Vogelmann, A. Covacci, L. S. Tompkins, W. J. Nelson, S. Falkow. 2003. Disruption of the epithelial apical-junctional complex by Helicobacter pylori CagA. Science 300: 1430-1434.